In the spring of 2015, New York State’s Office of Planning and Development (OPD) released a user-friendly gateway to its geographic information that uses Esri technology to help fulfill OPD’s mission of promoting sustainable growth and increasing resilience for New York communities. 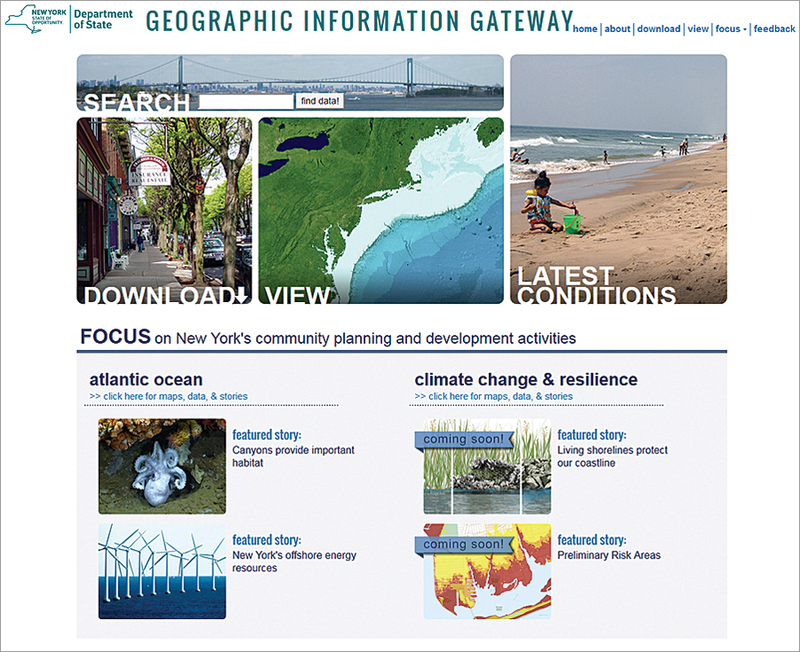 New York State's Office of Planning and Development Geographic Information Gateway home page provides several opportunities for discovering data and related content. The initial goal of the Geographic Information Gateway was to update and improve the New York Oceans and Great Lakes Atlas (Atlas), which had been developed using MapInfo’s MapXtreme. OPD officials realized the Atlas site was not easy for the public to use. Rather than provide a website for just downloading information, OPD wanted New York residents, decision makers, state agencies, academics, and internal staff to have access to information that was organized and presented in a manner that was easily understood and visually compelling. In addition, OPD wanted to explain why geographic information is important to New Yorkers, what it represents, and how it is used to inform decisions. Stone Environmental in Montpelier, Vermont, an Esri partner with extensive expertise and experience in building spatially aware data management systems and applications, was chosen by OPD to create a new gateway to geographic information that would provide public access to data, real-time information, and interactive tools. To meet the initial goals of the new gateway, Esri’s open source Geoportal Server was implemented as the basis for storing, serving, and managing geographic information. Geoportal Server relies on metadata content for data discovery. All geographic information that is findable, viewable, and downloadable within the gateway is stored as Federal Geographic Data Committee (FGDC)-compliant metadata records. All metadata is stored in an instance of the open source relational database system PostgreSQL. 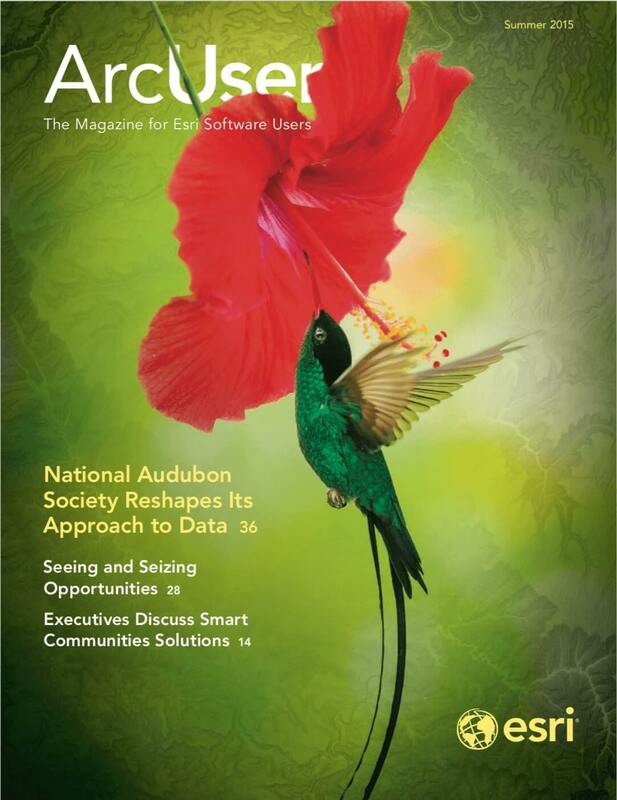 The PostgreSQL database was used with ArcSDE and SDE binary spatial data types, which allowed Stone to store not only the metadata records in the system but also full geospatial datasets. The Atlas did not use live map service content. All datasets in the new gateway are ArcGIS for Server map services, whether served internally by OPD or externally through partner organizations. The new interface, combined with Geoportal Server and ArcGIS for Server, provides a web mapping interface, allows easy searching and browsing of geographic information, and makes it easy to add discovered datasets directly with the web mapping tool for further visual exploration. The attractive layout, designed by OPD staff, provides easy-to-access links that reveal more than 400 datasets organized into eight categories that lead to extensive subcategories related to OPD activities. Web map interface tools allow sharing, printing, and animation of time series datasets. The web viewer interface is closely integrated with the search and browse functionality so datasets can be easily discovered and explored. In addition, the home page provides an overview of the gateway content and links to search and browse interfaces that allow alternative access to the more than 400 datasets. These independent search and browse pages also interact with the web map viewer. Alternatively—for users interested in the most up-to-date coastal information—a Latest Conditions page provides access to real-time information such as water quality, tide levels, and beach conditions across the state. Content for the site is managed through tables in PostgreSQL and ArcSDE. ArcGIS for Server provides functionality for querying and editing table content through secure REST endpoints. The original portal and atlas sites were hosted on servers physically located at a hosting facility in Troy, New York. To reduce friction during development and make the site’s capacity more elastic, the new gateway system was moved to the Amazon cloud. Now, as new data is added by OPD and its data storage needs grow, additional storage can be added painlessly to the cloud-based server. As the site’s popularity expands, the cloud-based server’s computing capacity can be increased and the instance cloned to provide load balancing or failover functionality. OPD felt that the major component missing from the Atlas site was an explanation of how geographic information relates to OPD activities. 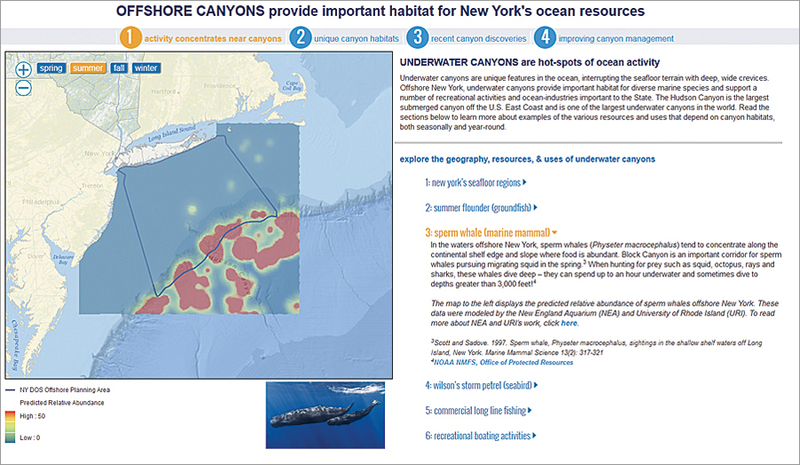 The site needed stories that highlighted real-life examples of the state’s use of geographic information and data to grow New York’s economy, ensure resilient communities, and plan for responsible use and revitalization of state’s land and water resources. The story template uses geodatabase tables to manage story content such as text, map layers, and links to internal and external content. A content management system was developed that enables OPD staff to develop, manage, review, and publish story content with ease through a user interface. To meet its goal to “support the resilient, sustainable growth of New York communities by advancing progressive land-use solutions, community development, and building standards and codes,” OPD partners with community-based organizations, academia, government agencies involved in development, natural resources, and social services as well as other stakeholders. A custom-built story map template provides a platform for communicating OPD activities through map content, text, videos, and images. At the outset of the project, OPD staff participated in developing the project’s vision, mission, and success criteria. During the initial visioning meeting, the staff’s ideas about the project outcome were distilled into a project charter. Various stakeholders were involved in numerous interactive and creative meetings that determined in detail the requirements for the gateway. OPD and Stone participated in biweekly meetings to review the project’s progress, desired functionality, and design requirements. The entire application was built using Agile software development techniques. Various functionalities were built in sprints over an 18-month time frame. Agile methods allow requirements and goals for the project to shift and change as the application was built. Weekly and biweekly meetings with all team members at Stone and OPD provided a constant feedback loop. The OPD team could see what Stone was producing and adjust the course of Stone’s work. In addition, various OPD programs worked together internally assembling stories to include in the gateway as Focus Area pages. 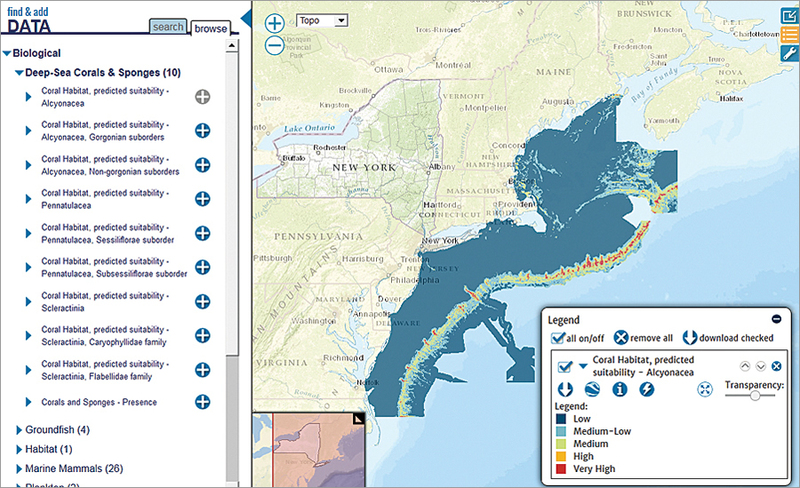 In its first release, the gateway primarily supports and showcases Atlantic Ocean and Climate Change and Resilience planning activities. Future releases will expand it into an officewide resource that will provide information relevant to all programs and support the office in its mission to increase the resiliency and sustainability of New York communities through progressive land-use solutions, community-based development, and building standards and codes. The project has enabled OPD to more holistically view its activities. It provides one place that highlights what the office is doing using interactive story maps. Each division has developed user stories for its constituencies. At the same time, OPD staff can now manage application content and publish and update data on an ongoing basis, which is a key goal for the new website. The gateway’s suite of information and tools is intended to serve as a valuable resource for New York communities, an educational resource for schools and universities, and a guide for the responsible development of the state’s resources. The OPD and Stone will continue to expand the application over the next two years to include more databases and program area stories with interactive content. Planned future functionality may include crowdsourced content and social media integration. Jeffrey Herter is the assistant director at the Division of Community Resilience & Regional Programs, New York State Department of State. Liz Podowski is a National Oceanic and Atmospheric Administration (NOAA) Coastal Management fellow at the Division of Coastal Resources, New York State Department of State.